Well, alrighty, now it seems like fall. That heat wave, “September Heat”, left us many gifts, and now we welcome the mellow coolness once again. September Heat brought on red peppers, orange pumpkins, a blitz of tomato ripening, a lower sun in the sky yet a return to shorts and light shirts, and wow! how lucky to have watermelons and canteloupe to help us through! We even had watermelons to eat while picking winter squash, an overlap of seasons we may have had before but certainly don’t remember. Squash harvest is typically a sunny day, often with a dry breeze, and since there’s tons of squash (5 tons this year) to bend over and pick up into bins there’s lots of sweat too. We remember trying the last watermelons left in the field on winter squash harvest days, in hopes of refreshment, and finding only watermelon wine (not as good as it sounds when it’s really just a very rotten melon.) But this year lounging in the field spitting watermelon seeds at each other after finishing a lovely squash harvest — that’s hard to beat. The rain is very welcome, and really, for us the timing was great — not too soon, not too late. We have been watering lots, and it takes time but since melons and tomatoes taste better and crack less when dry, the tradeoff is well worth it. But with melons done and tomatoes past their peak, we were ready. The soil was very dry and the worms (and we presume other soil critters) had gone deep underground to find moisture and/or died, either way reducing the amount of biological life in the root zone of this year’s and future years’ crops. Since our crops depend so heavily on the living, eating, pooping and dying of all those critters we’re glad to have the moisture in all the fields. We ran like the wind to sneak some cover crop seeds in as it started to drizzle, the larger disc we bought last year paid for itself again as it whipped around the field and incorporated the seeds into the top inch of soil, and we sat back and enjoyed the evening. And what a rain! Kind of old-fashioned in this new climate of severe weather — an all-night gentle soaker. There’s a chance we’ll get frost tomorrow morning, so we’re covering today. We might lose the beans, and the basil, we’ll try to save some but it might not work. Tomatoes and peppers are our main focus for covering, we’re not ready to say goodbye yet! There’s lots of info below, about crops in the share (where’d the spinach go?) and the storage share (sign up with one of us starting this week). We hope you enjoy the harvest! Spinach will hoepfully be back this week. We had to take a break from picking last Wednesday and Friday — it didn’t like the heat and was looking yellow and like it might all perish so we mowed some of it down to hope for better re-growth, and applied fish fertilizer to the whole section. The main problem appears to be bacterial or viral brought on by the stress of the heat wave. Fish-flavored spinach didn’t pass the taste tests of all of your hungry and hard-working crew, so we decided to wait a week or so to let it wash off into the soil. Currently it tastes fine, like our usual good early fall spinach, and we hope to start picking again tomorrow. As the nights get colder the spinach gets intensely sweet, truly like a piece of candy melting in your mouth, but it’s not there yet. 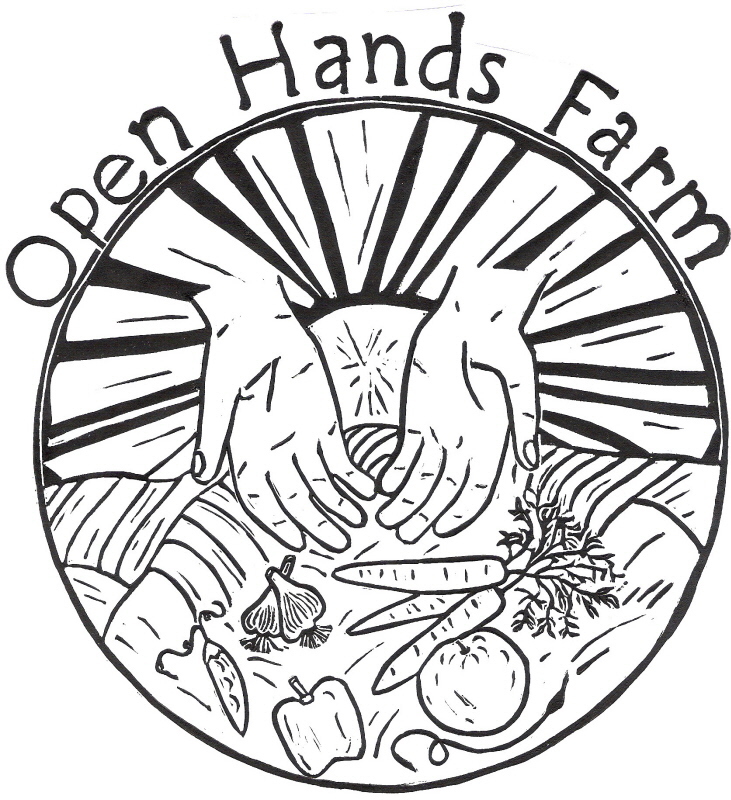 We, and many other farmers around the world, organic and conventional, routinely use fish/seaweed blends to fertilize crops in the greenhouse and in the field. In the field we rely on cover crops and compost, and sometimes the probiotic culture with a tiny dose of fish/kelp, for providing nutrients and biota to help crops make it through the stresses they encounter in their journey to harvest. So this is only the third time we’ve used the recommended dose of fish/kelp in the field, in situations where something went awry with the cover crop and compost plan. Since we all love spinach so much and it looked like we might barely have any to pick, we thought this might help it green up and grow a little larger. Then the weather cooled off too, and the combination of weather and nutrients seem to be helping it recover. Hopefully it can pull through and make great green leaves for all of us for the next six weeks! If you are allergic to fish, please check with us this week, we hope to talk to the manufacturer Monday about their recommendations for fish allergies. Melons were amazing! Thanks for all your feedback on them, we always like to know how they are/were, it helps us do a better job. Back in June’s cool and wet spell they were they were the saddest-looking plants on the farm, but they pulled out of it and they were nutso productive. Seems like the cover crop/compost routine did the trick there. A five-week melon season, with 2-3 per share for a couple weeks in the middle, that is something to write home about! We think Ben has eaten one to two melons a day for most of that time, being so hot and thirsty (and busy with all the harvest) that sometimes it was the main course. Thank you soil, thank you melons! Now we move on to winter squash, the next big sweet member of the curcubit family to strengthen our arms and prepare our bodies for winter. (Winter!) First it’s been pumpkins and hubbards — Remember to wait at least two weeks before eating them to be sure they’ve cured and developed their best flavor. We normally cure all winter squash for you, but since the big pumpkins were ready we wanted to get them to you to display, and we know some of you would prefer something besides a jack-o, so we decided to prematurely offer the pumpkin-like edibles alongside. Some of those may need longer to cure, but in two weeks they should all be improved enough to do the trick. Those Labor Day orange pumpkins will hopefully last you all the way to Halloween, or at least long enough to be worth your effort carrying them. All the pumpkins can be eaten, flesh and seeds, (beware of gourds) but the pie pumpkins have a less watery flavor. Cheese pumpkins, when they’re really good, are thick and yes, cheesy on their own. Honestly one that good is rare for us but we keep trying. There are enough pumpkins outside for everyone to take another this week. 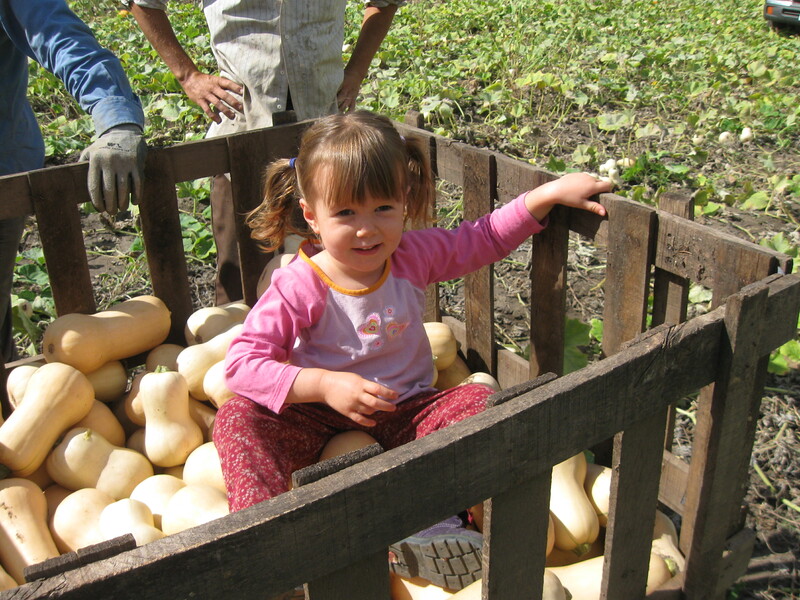 This week in the barn we’ll have spaghetti squash again, and probably a few acorns and carnivals. They yielded better than we’ve ever seen before; we have four times last year’s harvest! The acorns we’ve eaten have been pretty good but not up to our high standards for curing squash — they should be sweet and flavorful enough to eat on their own, unadorned, if desired. So if you take one this week either dress it thoroughly or wait a week or two. Storage for all winter squashes is best at 55 degrees and 55-70% humidity — room temperature works well for short term storage. But if you took a hubbard or pie pumpkin and want to eat it in November, your chances of success are higher if it’s stored in a basement or garage with conditions closer to that ideal. As you see on the driveway, we’ve got all the squash harvested and curing away. Last year was a mostly Butternut year, as it did well and the others did poorly. This year the Butternut yielded less per acre (though we plant more of it than any one of the others) but the rest of ’em did sparklingly well. Barring problems in curing and storage, we’ll have ample supplies of all kinds. Whew! That’s nuts in a squash shell, it is clearly a big part of local fall and winter eating! Tomatoes are still coming in well, but will probably be slowing down by mid-week as they adjust to the new temperatures. What a run! It’s been exciting to see so many heirlooms come in without cracks or other blemishes. We have some plants in one of the hoophouses, to try to have a tomato or two for everyone well in October. The field plants look amazing and have lots more fruit, but the indoor ones are less happy and have less fruit hanging, so if we aren’t able to protect the field plants from frost it will be slim pickings. But for now, we’ve got them all! Peppers are also going strong and the reds will slow down with the coolness, but there still should be plenty to go around. They are one of the most beautiful things about a warm fall. Globe Eggplant is still coming but the Asian varieties really, really don’t like fall. Frost might take them all away though. For onions, we’ll also have shallots this week. Oh my so sweet! Use like any onion, and their sweetness permeates a dish, it’s remarkable. This year as a bonus they’re big and mostly have just two “centers” or parts to the whole (often shallots grow with several small parts, similar to garlic, requiring more peeling per volume of onion to use.) Celery might survive a frost, and soon we’ll start picking celeriac (celery root) too. Lettuce and greens are looking good and are quite cold-hardy. Last week was the final week for garlic to be in the share; from now on it will be available for sale in the barn for $1 / head, individually or for larger amounts. No need to pre-order, we should have it on hand. Broccoli and cabbage need to be given a speeding ticket. They have been incredibly healthy and productive this year, and we’re sad to say they might go away for a week, or more. They might not, if they can stay healthy and grow not too fast and not too slow. They grew so fast (and so large!) in the mild summer that the last plantings–meant for October harvest — are starting to be ready now. We’ll try to drag them out but if we run out of heads to pick it will make a dent in the size of the share. We’ve got lots of other things to choose from, but they will be missed if they go. We’ll plant some later plantings next year in case they get lead-footed again. Looks like the new kale planting is ready to pick, enough to give everyone a taste at least. Finally, other crops coming later on in the fall, in October mostly, include : sweet potatoes (will start harvesting this week and need a couple weeks to cure), leeks, parsnips, turnips, daikon and watermelon radishes, and brussels sprouts. If they can all stay warm there will still be lots to pick, so if you’ve got any still laying around we need U-pick containers. Thanks for your help! Pretty much everything is still going strong, but if it gets frosty it will be the end of cherry tomatoes, green beans, tomatillos, & ground cherries. We tried to cover one row of cherry tomatoes but the wind was blowing too hard at the end of the day. Maybe the breeze will keep up and keep the frost from settling! For herbs: cilantro, basil, dill, parsley, oregano, thyme, cutting celery, and marjoram. Basil will get brown spots and go patooey around 34 degrees–even under a cover it can get nipped. We’ll see. Raspberries Overall the fruit is looking good. Pest levels are lower than last year. With the coolness we expect they’ll slow down but keep ripening. Most of our flowers are frost-sensitive, except calendula and one or two others, it would be sad but it might be time to let them go. This week’s selection is : Garlic for $1 / head, Lettuce Mix for $5 / lb, Carrots and Beets for $1 / lb, Globe Eggplant for $1.75 / lb, Cabbage for $.50 / lb. Bulk tomato boxes, seconds, 12 lb for $18 or firsts, 12 lb for $24. Green and Red Peppers for $2/lb. Garlic can always be purchased in the barn, no need to pre-order. You can sign up with one of us in the barn. A deposit of $10, or the full amount, by Oct 25th will hold your spot. For a price, we believe $85 is fair for all of us. In general, this year’s storage share will be similar to the last four years’, varying according to this year’s yields. It is separate from the regular season share, a one-time pickup in November before Thanksgiving, and we hope it looks something like this: a big bag of super sweet fall carrots (our goal is 20 lbs), a smaller bag of mixed fall roots, 3-5 squash, + 10 lb potatoes, + 5 lb sweet potatoes, Brussels sprouts, garlic, onions and leeks, kale and maybe cabbage. For dried herbs, a selection of thyme, sage, oregano and rosemary. Potatoes and sweet potatoes we haven’t harvested yet but from digging a few forkfuls, yields seem to be ample. Cabbage might be all gone due to the speeding ticket mentioned above; brussels sprouts, cabbage and kale are cold-hardy but if we get January cold in early November then they might be in short supply. Everything else is certain as certain can be in an uncertain world. All for $85, a fair and reasonable price for all of us. We provide info and inspiration on eating and storing all that goodness too! The picture below is most of one storage share. Let us know if you have any thoughts on it or questions about it, we’re happy to answer questions. If there’s any part of it you won’t be interested in having, just let us know on the pickup day and we’ll donate it to the food shelf. We love providing this food for you, we hope you enjoy cooking and eating it! This year’s final share pickup will be the last week of October. Because that week sneaks into November we will need to start harvesting for the storage share, so we’ll be consolidating the final week of pickups to just Monday and Wednesday and extending the pickup hours to end at 6:30, just for that week, with Friday people coming on Monday or Wednesday too. Closer to the time we’ll be in touch about switching days that week. If you usually come Fridays and wouldn’t be able to make it any other day, that’s fine, we will make arrangements for you to pick up your share. Renewal Letters for next year will be handed to you in the barn next week. For potatoes for sale this fall, we’ve got Adirondack Red and Carollas. The Adirondack Reds are red on the inside too! The Carollas are similar to Yukon Gold. The potatoes are coming from our friends’ farm called Fazenda Boa Terra. Their web site can be found here. They grow organically but their potatoes are transitional this year, due to a new field that they are farming on. Each 5 pound bag will be $6. Share Pickup Hours — Monday, Wednesday Friday 2:00-6:00pm. You can U-Pick any time. Halve the squash, remove the seeds and fibers, and cut into quarters or sixths. Steam over boiling water until tender when pierced with a fork, about 30 minutes. Meanwhile, melt the butter in the oil in a large saucepan over low heat. Add the garlic and cook until softened and fragrant, about 10 minutes. Do not let the garlic color. Stir in the broth and sherry. Bring the mixture to a boil, then reduce the heat and simmer for 30 minutes. Stir in the milk and potato and adjust the heat as needed so the soup continues to simmer until the potato is completely tender, 30 to 45 minutes longer. Purée the soup in a blender. Return the mixture to the saucepan. Using a fork, scrape the squash into a bowl and separate the strands with the fork to create “spaghetti.” Add to the saucepan along with the cream. Season to taste with salt and pepper. Simmer until heated through. Serve at once or hold overnight in the refrigerator to allow the flavor to develop even more. Reheat gently before serving. I have actually never seen this recipe in a written form, it has been passed on from farmer to farmer. I will do my best with quantities. Change it up where you feel necessary. It is delicious! Roast the hubbard whole for 2 to 3 hours at 350 degrees. Before putting in oven, poke it with a knife to relieve pressure while baking. The skin of the hubbard will brown while baking. While this is in the oven, cook the rice. Then mix it with all the other ingredients. No need to sauté the onions first, they can go in raw. Poke the squash and if it fells slightly soft, take it out. Let is cool until you can handle it comfortably. Cut a lid, as though you were cutting a lid for a jack-o-lantern. Scoop out the insides and replace them with filling. Bake until it is all warm and cooked through, about 30-60 minutes.